In 2015, the 25th Annual Conference of Human Dignity and Humiliation Studies was conducted in Kigali, Rwanda, from 2nd - 5th June. Please see the report. Rwandan readers remarked that the message of this book is hugely important, namely, that genocide humiliates both victims and perpetrators. When the statue of Saddam Hussein fell and Iraqis danced on the body, hitting it with their shoes, there was joy. Moments later, when an American soldier climbed the statue to place an American flag on the face, there was a national gasp, a moment of humiliation for the Iraqis. Americans had claimed to be liberating them, but the placing of the American flag was a sign of conquest. The flag was quickly removed and replaced with an Iraqi flag, but those tense moments were a brief example of the power and potentially far-reaching, volatile effects of humiliating acts, even when unintentional. In this fascianting book, Dr. Linder examines and explains, across history and nations, how this little-understood, often-overlooked emotion sparks outrage, uprisings, conflict and war. With the insights of a seasoned psychologist and peace scholar, the analytical skill of a linguist who speaks seven languages, and the scholarship of a Columbia University professor, Lindner explains which words and actions can humiliate, how the victim perceives those words and actions, what the consequences have been, and how individuals and organizations can work to avoid instances in the future. 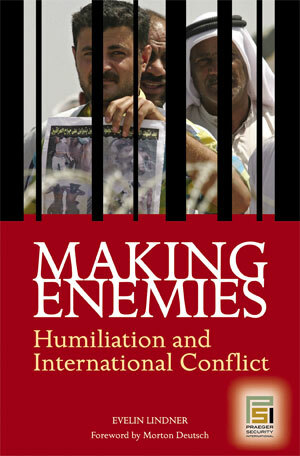 From acts of humiliation in Nazi Germany to intentional humiliations such as those at Abu Graib, from events during the bloodbaths in Rwanda and Somalia, to precursors to the attacks on the Twin Towers in New York, Lindner offers vivid examples to explain how humiliation can be at the core of international conflict. I first met Dr. Evelin Lindner in December 2001 when she was the speaker at a Colloquium of the Peace Education Program at Teachers College, Columbia University. I was attracted to the Colloquium by the title of her talk, "Humiliation and the Roots of Violence." When she spoke, I was impressed by the importance and originality of her ideas. She showed how humiliation - a profound emotion which, unfortunately, has been little studied by psychologists - often plays a critical role in leading to destructive international and interpersonal conflicts. Her talk was illustrated by fascinating examples drawn from her rich and varied international experiences in such countries as Rwanda, Somalia, Egypt, Germany, and the United States. As a result of her talk, she was invited to teach a course on the psychology of humiliation in the Program on Conflict Resolution at Columbia University 's Teachers College. Her course was extremely well-received by the students and faculty. During the summer of 2002, I read many of Dr. Lindner's papers and had an opportunity to talk with her about her work. I urged her to write a book that would present her ideas to a wider social science audience as well as to policy makers and the lay public. I consider this book to be a very valuable and original contribution to understanding how the experience of humiliation can lead to destructive interaction at the interpersonal and international levels. It has profound and devastating effects. It shakes the foundation of one's identity by devaluing one's worth and by undermining one's inherent human right to care and justice. Dr. Lindner develops with great insight the important idea that our awareness of humiliation as a powerful and pervasive experience in human affairs has emerged only recently. She attributes this emergence to two phenomena: egalization and globalization. Egalization (a term coined by Lindner) refers to the development of the political ideal of equal dignity during the eighteenth century, as reflected in the American and French revolutions. Globalization refers to the increasing interdependence and interconnectedness of peoples throughout the world. A woman in Afghanistan who has always accepted her husband's right to beat her feels humiliated when she learns through television that, in other parts of the global village, women are viewed as equal to men and husbands are imprisoned for beating their wives. Dr. Lindner is a very thoughtful person who has read widely and deeply in the social sciences. She has also had a rich, varied experience in many countries as a psychotherapist, counselor, researcher, and global citizen, immersing herself in and embracing diverse cultures. The book should interest a wide audience. Psychologists and other social scientists will find new ideas to enrich their understanding of how humiliation contributes to destructive conflict and violence at the international as well as interpersonal levels. Policy makers will not only be exposed to these new ideas but also to their policy implications. And, beyond the foregoing, all readers - whether they have a professional interest or not - will find much of value to their personal lives. This volume is a path-breaking work that skillfully explores the deeper intricacies between war and peacemaking from a social psychological lens. Lindner cogently argues that there is a strong relationship between humiliation and international conflict. She defines humiliation as "enforced lowering of a person or group, a process of subjugation that damages or strips away pride, honor or dignity." The analysis focuses on the humiliating effects of words and actions, and those related to incidents of violent conflicts. Specific incidents of humiliation discussed include the humiliation of the Hutu by a dominant Tutsi minority, which resulted in the 1994 Rwandan genocide; Germany's humiliating defeat in WW I made worse by the harsh terms of the Treaty of Versailles; and the placing of an American flag on a statue of Saddam Hussein after the 2003 US invasion of Iraq. In particular, the author concludes her very original work by arguing that in order to avoid the destructive effects of humiliation, it would be necessary to "marry globalization with egalization--equal dignity." The implication is that globalization, in its current form, is humiliating to many in the world. Highly recommended. Upper-division undergraduates and above. [T]he objections that one may raise to particular propositions in a book that addresses the wide range of individual and social conflicts should not deflect us from recognizing the substantial contributions this volume makes to the resolution of human conflicts. As Lindner has demonstrated, humiliation, patently and subtly, is a common and destructive component in interactions between individuals or groups in conflict situations. It is an element that not only should but can be eliminated in social interaction. The frequency of references to the consequences of humiliation, often accumulated over generations, in contemporary international conflict makes Lindner's topic an important and potentially fruitful one. Moreover, it is one that economics-mimicking approaches to international relations are likely to miss and is, accordingly, best served by approaches able to draw on psychology. Lindner is a social psychologist or considerable erudition, with deep knowledge of different cultures and fieldwork experience in many areas of conflict, particularly in Africa. She moves effortlessly between considerations of personal experiences of humiliation, many of them poignant, and their potential structural causes. This is a social psychological investigation of the role of humiliation in human conflict. Lindner first lays out a theory of the mental and social dynamics humiliation and proposes the need for "egalization" (the undoing of humiliation) for a healthy global society. She then presents chapters on the role of misunderstandings in fostering feelings of humiliation; the role of humiliation in international conflict; and the relationship of humiliation to terrorism and torture. She concludes with a discussion of how to defuse feelings of humiliation. A breath of fresh air! If you could read one book on globalization and creating the kind of global future you'd want to live in, this is the book to choose. Clear, eloquent, passionate and practical, you emerge from this book with a sense you understand the key to our global conflicts and how to get beyond them. Lindner characterizes the state of our world today as a "ramshackle global village," some of whose neighborhoods are racked by violence, many by destitution, and a relative few by prosperity. She asks: What gets in the way of the cooperation that could make this a better global village for everyone? Born in Norway, having worked for years as a psychotherapist in Egypt and done field research in Rwanda and Somalia, currently dividing her time between Japan and China, she developed and documented the stunning, "but of course!" insight that it is humiliation that makes for the bitterest of intercultural enemies. Intentional "messages" and unintended slights/insults set in motion the single greatest obstacle to peace, the experience of feeling humiliated at the hands of another group. The threat to peace lies not in the clash of civilizations, she writes, but in the clash of humiliations. The great divide on the planet is between moderates of all groups, who must work together across boundaries, and extremists who become "humiliation entrepreneurs" in Lindner's resounding and very practical language. Ours is a time pivoting between two ages, she writes: a passing age that saw the dividing up of the value of people into higher and lower as natural, during which humiliating those below was deemed proper and right, and an emerging age of human rights in which all humans are deemed of equal value. "I promote human rights ideals that conceive of human worthiness and dignity as equal for every human being" she writes. In this emerging paradigm, belief in the equal value of all human lives is seen as right while humiliating others (or ourselves) is seen, not as proper, but as abusive and an outrage. The danger this dawning sense of outrage poses during the transition into realizing that we are all of equal value cannot be overstated, she stresses. The implications for understanding our times as a transition between two paradigms pertaining to humiliation are spelled out in detail and presented so as to be easily understood and readily applied. This review provides only a glimpse into a book densely packed with penetrating insights, "so that's what that was about" examples from recent and current history, and guides to action. For a stunning vista as to where we are, where we're going and what we need to do to get there, Lindner's well-written and extremely timely book is extraordinary. A "must-read" and a "must-pass-on-to-others!" Reading Dr. Lindner's excellent book can be a difficult -- but essential and growth-producing -- experience for Americans. Most of us realize that our country is not very popular around the world these days. Many of us are willing to accept that the U.S. has earned some or much of this hostility. But, I suspect very few of us understand how deeply many of the dynamics described by Dr. Lindner have permeated our national behaviors. It is difficult to see how ideals we have long cherished might work, in today's global world, to make us unfit for global citizenship. Dr. Lindner writes often about the fact that many citizens of the United States have a basic sense of having been mistreated by our ancestors in their countries of origin. This national sentiment produces mistrust and a resulting determination to isolate ourselves from the rest of the world. Although I read her ideas a year ago, it wasn't until the November 7, 2006 that I was able to see how these psychological premises permeate our thinking. President Bush began his post-defeat press conference with a few words about his responsibility to guide his party to positions that voters will find more acceptable. He very quickly veered from this position of leadership, announcing that his "primary responsibility" is to "protect my country from attack." At first I was confused. Could Mr. Bush be serious? Did he REALLY believe that protecting the US from attack is an all-consuming or demanding job? Most Americans probably believe that it is. However, the facts (facts I would not have seen before reading Dr. Lindner's book) tell a different story. Unlike most countries in the world, the US is very well-protected by two huge oceans. This country has been attacked twice in its history -- once in 1941 and again in 2001. To be attacked twice in almost 250 years is an amazing history of safety. The truth is, attacking this country is a very complex undertaking, requiring skill, planning and dedication. It's not something that can be accomplished by a casual enemy. But, somehow (and Dr. Lindner tells us how) this country has developed a "fortress" mentality. After reading Dr. Lindner's work, I see how disastrous much of our national psychology is. That psychology distracts us from our true "primary responsibilities," such as protecting the environment and assisting the poor around the world as they strive for a decent standard of living. Even worse, that psychology isolates us from the rest of the globe, making it almost impossible for us to assume our natural places in the human family. "Making Enemies" will help all American readers understand that it's safe to stop worrying about protecting ourselves and start moving more generously and graciously out into the larger world. I recommend this work to everyone who cares about the future of the human race. In the Journal of Intercultural Communication, copyright 2008 by SIETAR Japan. Bøger, 30, 27. juli 2007, side 3. Ancient Chinese always attach great importance to the issue of humiliation, honor, and dignity. The Book of Rites (1st Century), a Confucian classical work, defines a true Confucianist as one who “prefers death to humiliation.” Contemporary China still sees the motto that “a gentlemen prefers death to humiliation.” Su Shi (11th Century), a famous poet and politician, wrote a master piece entitled “Liu Hou Lun,” which contrasts a man of mediocrity with a true hero and how both would respond differently when exposed to humiliation. Considering self-cultivation and refinement with respect to accomplishments and success, he suggests that a man of great ambition should “refrain from shock and anger when confronted with unexpected and unreasonable humiliation.” However, refraining from shock or anger does not mean refraining from resentment and hatred. Patience and restraint in the short term can be a preparation for a long-term strategy. But exactly what is dignity, what is humiliation, what is the essence of all these? Few people touch upon such issues. With respect to the topic of honor and dignity, China has a unique and widely known notion, that is “face.” This notion is frequently applied in everyday speech, yet very few people can accurately define it. In real life, whether a person has maintained her “face,” is often associated with status, wealth, achievement, and reputation. As a result, the focus on “face” is almost entirely concentrated on economy and power relations. Moreover, face seems to be relevant only in relation to acquaintances, not to strangers. If the concept of face is used to replace the concept of dignity, then the issue of dignity becomes superficial, ignoring its deeper foundations in the human existence. Thus we may see that giving “face” to people is fundamentally different from extending respect for equal dignity to every human being. Dignity and humiliation can be seen as a contradiction which exists at all levels; at the micro level, it is related to individuals and families, while at the macro level, it is related to nations and states. By nature, every person, regardless of her status and wealth, is eager to receive respect from others. Thus, in all types of conflicts in the world, no matter how they are manifested, the most serious problems occur when human dignity is violated. In our highly commercialized society, in an era of diverse interests, when people increasingly overlook the essentials of human nature, we need to give more attention to the issue of humiliation and dignity. When dignity is violated, how may it influence our perceptions of ourselves and of others? What is our response to humiliation? Does our response depend on subjective aspects such as our character and culture, or on objective aspects such as economic, political, and social relations? Do our feelings vary if we are confronted with humiliation as individuals, groups, or nations? Once the humiliation-revenge cycle begins, how can we stop it? To all these burning questions, all of which can make us feel uneasy, upset, or even deeply hurt, Dr. Evelin Lindner gives us a systematic and profound analysis and interpretation in this book, and ultimately, she points out a way forward for us, which is not to overlook the problem of humiliation, not to deny it, nor react with violence, but to transcend humiliation and achieve what she calls egalization. This book is a masterpiece which is foundational for Human Dignity and Humiliation Studies (HumanDHS), covering the area of psychology, sociology, anthropology and other disciplines, involving the culture and history of many countries and nations. In this book, Evelin analyzes the effects and influences of humiliation from three aspects: the role of humiliation in the human mindset, the role in the world, and how good intentions may sometimes lead to humiliating outcomes; she discusses humiliation from the perspective of human nature, social hierarchy, historical evolution, culture difference; she touches upon concepts such as dignity, honor, humiliation, humility, shame, and so on; she presents a large number of relevant pieces of evidence which shock the human heart; she provides a convincing analysis and interpretation to show the destructiveness of humiliation in interpersonal relationships, intranational relations, and international relations; and she brought all this into a systematic theoretical framework. It should be noted that “humiliation” contains two meanings in this book, namely, to humiliate and being humiliated, relating to both the perpetrator and the victim. The author has proposed many thought-provoking ideas and constructed a number of rigorous concepts. It is no exaggeration to say that this is a pioneering work that establishes humiliation and dignity as an independent academic subject. This book brought fame to Evelin. As soon as it was published, it was widely noticed, and was honored as “Outstanding Academic Title” by the journal Choice for 2007. The uniqueness of this work is related to Evelin’s rich and legendary life experience. Evelin’s childhood and youth were full of hardship. Evelin was born in 1954 in what used to be West Germany. Her parents were German descendants living in Silesia, which became part of Poland in 1945, unfortunate enough to have their lives ravaged by World War II. After the war, together with many other German descendants, they were forced to leave Silesia where their ancestors had lived for many hundreds of years, and were transported to the strange land of Germany, without any property. Because of the macro background of those times and her unique personal experience, she can offer extraordinarily profound reflections on the issue of humiliation and dignity. 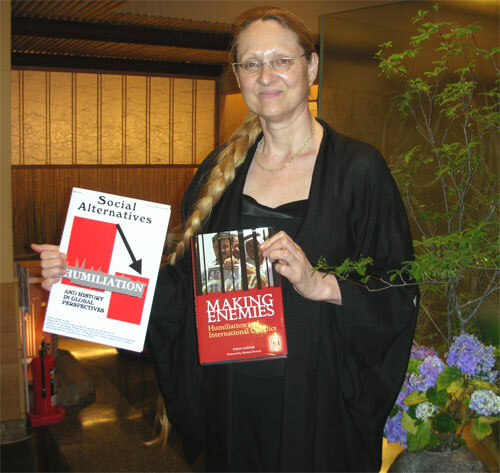 In her career, Evelin has lived in many countries around the world, and has gathered in-depth and meticulous observations of social and human nature, including immediate experience of humiliation among individuals, groups, and nations. She has earned two doctoral degrees, one in psychology and one in medicine, and has been widely recognized and praised for her theoretical explorations and practice related to dignity and humiliation. Twice she was nominated for the Nobel Peace Prize (2015 and 2016). This book abounds with wonderful comments related to humiliation and dignity, and these comments are closely related to the times and societies in which we live. Looking back on history, we may find that “what was accepted before as ‘normal’ should be rejected now as humiliating.” People’s “expectations of equal dignity and opportunity rise, and any attempt to lower the expectations of any one group becomes an offense against all groups, and a threat to the hope for a new and better social order.” The privileged groups’ “superiority may have humiliating effects on those who are less privileged and neglecting this phenomenon may be dangerous.” “The powerful remain blind to the feelings of humiliation they cause in their subordinates until those feelings reach boiling points.” This book gives a warning to be cognizant of these burning social phenomena. Although this is a very serious academic work, and it explores such a heavy topic of such profound philosophy and psychology, it did not prevent the author from using the most popular language, and making use of intriguing stories to explain and elaborate her message. Moreover, the whole work is full of moral feelings which originate from her deep sorrow when seeing the world suffering so bitterly, feelings which originate from her love and devotion to all human beings, shining with the light of humanitarianism. When you are reading this book, every now and then you will be inspired to echo and feel associations, a smile of understanding may light up your face, or you cannot help cry out loud at the marvels of the work, or sigh with deep regret, or feel bitterness in your heart. Reading this book, people will gain social knowledge, and at the same time, be kindly alerted by the voice of an honest and benevolent elderly. Whether you are a major policy makers, or ordinary reader, this book will be your treasure for life. Especially at a time of transformation, when various conflicts become ever more manifest, this book comes just in time. I have known Evelin for many years. I am deeply impressed by her extensive and rich learning and her devotion and love. Her versatility and rich imagination, as well as her kind consideration, ability to understand others, and nuanced tenderness when she relates to people are equally impressive. It is because of all those myriads of virtues and personal charisma that more and more people are deeply touched and inspired by her to participate in the discussions on humiliation and dignity. As a result, Human Dignity and Humiliation Studies now come into being as a new discipline full of vitality. Therefore, what is recommended here is not only a good book, but also a friend, who is very dear to your heart. Evelin Lindner's Humiliation is destined to take its place alongside the classic inquiries into the root causes of war and violence. Lindner's probing examination into the etiology of violence is reminiscent of Hegel's analysis of recognition and its absence, and of Sartre's explorations into the etiology of hate. She makes a compelling case that the indignities that individuals and states inflict on each other come back to haunt them. Lindner's brilliant, insightful study reveals the limitations of the doctrine that the best defense is a good offense. Her analysis demonstrates that if we wish to protect ourselves from violence, we must also take care not to give offense. Her book explores how humiliation has been used throughout history to divide, separate and control people. She makes us understand that equal dignity is a key to peace, justice, and social order, and tells us what we can do to establish social relationships based on mutual dignity. Humiliation goes beyond diagnosis to chart a path toward a world that takes seriously the universal intuition that when it comes to dignity we are truly all created equal. - Robert W. Fuller, former president of Oberlin College, Chairman Emeritus of Internews, Author of Somebodies and Nobodies: Overcoming the Abuse of Rank. Although humiliation lies at the heart of much of human violence and despair, it has until recent years been almost completely ignored by the psychological and social sciences. During years of work in preventive mental health and a professional career devoted to helping organizational and community leaders create more life-affirming settings, I had gradually become aware of the powerful nature of the humiliation dynamic and embarked on a series of exploratory studies to determine the extent to which it affected people in various walks of life. By 1991 enough information had become available to create a special issue of The Journal of Primary Prevention, the thesis of which was that an understanding of the humiliation dynamic would help to prevent emotional distress and contribute to the understanding and solution of such social pathologies as sexism, racism, ageism, discrimination against those with physical and emotional disabilities, and degrading practices in the criminal justice system. The issue generated little response, however, among colleagues in prevention, community psychology, and community mental health. And then Evelin Lindner came along with a lovingly, vigorous transdisciplinary articulation of the importance of understanding how humiliation serves as a destructive force in international relations. She has written extensively on the subject and has mobilized an international group of social scientists, mental health experts, philosophers, and systems thinkers dedicated to creating both awareness and understanding of how important it is to maintain a high level of dignity and respect in human affairs at all levels. The present book is an important step in Dr. Lindner's mission of alerting political leaders, policy makers, professionals, social scientists, and interested citizens to the vital importance of this topic. For those of us who are committed to the integration of social research and action it represents a significant act of leadership on the part of an outstanding expert and humanitarian in the field of human affairs. - Don Klein is a Psychologist and Behavioral Scientist. He has been one of the first to explicitly examine and write on the humiliation phenomena. His first publication on humiliation goes back to 1991 (Journal of Primary Prevention on the Humiliation Dynamic, Vol 12, No. 2, Winter, 1991; Vol 12, No. 3, Spring 1992). He has written numerous books and has conducted extensive research on how families and organizations use humiliation as a tool of control and socialization. An understanding of the challengingly fascinating, universal, multidimensional phenomenon/process of HUMILIATION calls for a comprehensive, inter- and trans- disciplinary research program. Has that been achieved successfully yet? Evelin G. Lindner´s volume is a pioneering, initial answer in the affirmative. Until I started exchanging e-mails with that great peace patriot a couple of years ago, my perception of HUMILIATION was mostly focused on the communicative dimension and I would then typically ask questions such as these: (1) what do persons say when they are being humiliated or when they humiliate others, intra and interculturally? (2) What kind of phraseologies do language users activate when they play the role of either humiliator or humiliatee? Are there universally shared statements, such as "I've never been so humiliated in my life"? (3) How do dictionaries for second language learners typically illustrate humiliating uses of language and who is made visible in illustrative examples? Women (as wives), prisoners, athletes, students (in classrooms)? Are entries on Humiliation in dictionaries gender-based? Now thanks to Evelin's broadly-based work, I feel as if I've traveled on a thorough, thoughtful, and timely train (if you will pardon my metaphoric alliteration...), having thus benefited both theoretically and applicationally. Although Evelin's great humility has led her to refer to her research as in its infancy as a Theory of Humiliation, there is much in the book of relevant applied nature. To give but one example: all of the HOW sections provide food for thought and (inter)action. Such mini-essays of advice and wisdom are preceded by catchy headline-like messages: "Be aware of changes! ", "Do no harm!". The wording of the HOW sections is provocatively attractive, as for instance in "How all aspects of life are affected by the call for equal dignity." Linguists, discourse analysts, communication scientists, language-teacher and literacy educators will find much in this book to inspire them as HUMANIZERS, that is, as persons imbued with the ideals of dignity, human rights, justice, peace, and hope and who apply such values in their interaction with others. In a nutshell: Evelin's book is exemplary as she communicates her experiencing HUMILIATION (directly and indirectly in varied cultural contexts) in a style which can be described as compassionate, constructive, courageous, and creative. Let me use the train metaphor again and ask readers of this book to take their seats on this train to EGALITY (to use one of Evelin's key concepts). By doing so, you will learn that scientific discourse can be deeply humanizing, and above all dignifying, as Evelin has so eloquently demonstrated. All aboard then, and may communicative peace be with you. - Professor Francisco Gomes de Matos teaches linguistics and languages at the Federal University of Pernambuco (UFPE) in Recife, northeastern Brazil and has served as a visiting professor at the Universities of Texas (Austin), Mexico, Ottawa, and Georgia (Athens, USA). Gomes de Matos is the author of two pioneering pleas: for a Universal Declaration of Linguistic Rights (1984) and for "communicative peace" (1993). His current research interests include linguistic rights and responsibilities (of language users) and peace linguistics. "Humiliation: A New Basis for Understanding, Preventing and Defusing Conflict and Violence in the World and our Lives" by Evelin G. Lindner highlights a hitherto neglected but critical and powerful factor in the aetiology of conflicts and war from the perspective of social science with intimate knowledge of relevant historical and contemporary facts. Her knowledge of history is vast and the book is based both on scholarship and her personal, cross-national field experience in counseling. She focuses on the strand of humiliation that runs through all major conflicts and wars of the world. It is deep in insights about the dynamics of war and devoid of jargon. Towards the end she offers a paradigm based on four parameters and demonstrates its applicability across situations. She offers concrete suggestions about what the various players at the macro and micro level can do. A normative vision of a global village with infinite knowledge and an egalitarian spirit guides her undertaking. - Dr. Dakshinamoorthi Raja Ganesan is the former Head of the Department of Education at the University of Madras, India. Dr. Ganesan has been elected twice to the Executive Board of the International Sociological Association Research Committee on Alienation (ISA RC 36) in Mexico (1982) and New Delhi (1986), and has retained this position for a third term, Madrid (1990). Evelin Lindner describes herself as a global citizen and I believe that gives her a perspective on the world that is urgently needed if our planet is to survive. Most of us subscribe to rather local identities, while Lindner authentically has the well-being of all humankind at heart. More so, she draws our attention to the fact that her perspective is not merely an idealistic personal choice, but the only perspective feasible in a globalized world. Local self-interest is deeply intertwined with care for the globe, even if we fancy overlooking this, in a situation where we all depend on each other. This interdependence, among others, makes strategies counterproductive that use humiliation in order to gain advantages for "us" against "them." Disastrously, "self-defense" that uses humiliation, rather than leading to peace, might trigger catastrophic cycles of humiliation: the respective "enemy" might respond in kind, namely with humiliation-for-humiliation, instead of offering subservient humility and humbleness. In Lindner's book, emotions are not viewed as timeless or independent of history. The way emotions are felt by each individual is conceptualized as embedded within larger historic and cultural frames. Lindner analyzes concepts such democracy, communism, capitalism, modernism, post-modernism, modern information age, as epiphenomena. Psychological states and emotions, such as pride, honor, dignity, humiliation, and humility, are conceptualized as dependent on historic developments that stretch longer, namely thousands of years. She bases her analysis on what I would call "world anthropology" that is inspired by anthropologists such as William Ury. I highly value this approach since I believe that usually our view is too myopic; important lines and patterns may become apparent only when we dare to develop broader views. What I cherish about this book is that it is inspires hope. It suggests that the coming-into-being of a global village entails benign consequences, namely the emergence of One single in-group with all its benign connotations. Out-group categorizations with all their destructive biases lose their basis in reality in tact with more and more people feeling that they are part of One single family of humankind. However, as Lindner warns, feelings of humiliation represent the "nuclear bomb of the emotions." People feeling humiliated and set to respond with deadly strikes of humiliation-for-humiliation, embody the most threatening weapons of mass destruction. Since dynamics of humiliation are among the most significant disrupters of peace, identifying, preventing and avoiding them is crucial. This book helps with this task. It ends by calling for a Moratorium on Humiliation. - John Steiner, Networker, Spiritual Activist, and Philanthropist, brings together people, ideas, projects and funding around common cause. He has been a Founding Member and Leader of the Threshold Foundation, a national association of people with earned and inherited wealth who have come together to pool their money to support social and transformational change activities. He is a Founding Member of the Social Venture Network, a national affiliation of socially responsible entrepreneurs, investors, and social entrepreneurs whose mission is to develop a triple bottom line that recognizes the importance of healthy profits, healthy people, and a healthy planet. He has served as a Principal, Consultant, and Board Member of a number of national and international organizations dedicated to issues of collaborative governance, international peace making, and economic and social development. He is Founder and Director of GEMS, Green Economic Movement Strategies, which employs entrepreneurial skills to intervene in the market place on behalf of a more ecologically sustainable economy. He is the Founder and Director of Creative Philanthropy Associates. Humiliation: A New Basis for Understanding, Preventing, and Defusing Conflict and Violence in the World and Our Lives, by Dr. Evelin G. Lindner, is yet a further contribution of this amazing global citizen's quest to explain the roots of conflict. From my vantage point as a Palestinian living in the midst of one of the most stubborn military occupations of our time, Dr. Lindner's words come to life as we face the Israeli occupation's daily creativity to humiliate every Palestinian to the point of despair. Dr. Lindner's work will now put science and logic into a phenomenon that, until now, no journalist could take a picture of and few victims could explain. - Sam Bahour is a Palestinian-American businessman living in Al-Bireh/Ramallah, Palestine. He is also a writer and human rights activist, one of few Palestinian authors bridging the gap and co-authoring with Israeli scholars. Bahour is Co-Editor of Homeland: Oral Histories of Palestine and Palestinians. Being alive can be described as moving away from being humiliated towards asserting our dignity and the dignity of others. We all recognize when humiliation is present and instinctively, in the urge for dignity, we choose to move away from humiliation, often making the wrong choice by entering the vicious cycle of humiliation. Most people engage, in one form or another, in acts of humiliation, being misguided by fear or the basic human need to survive. The current upheavals and injustices around the world are proof that humiliation has even become a weapon of mass destruction, be it in the form of wars, poverty, or human trafficking. This volume is an important contribution to initiating a societal in-depth systemic analysis, with a gender perspective, and beyond the academic world, about actions that must be taken to break through the vicious cycle of humiliation. Evelin Lindner, with a great sense of social responsibility, is arguing with much dignity that we must move this critical debate into society forcefully. This debate is an important element in the process of learning about human rights as a way of living and being. It is relevant to all communities around the world. Learning about human rights leads to transforming humiliating cultures into human rights cultures, thus eliminating acts of humiliation. - Shulamith Koenig is the winner of the 2003 UN Human Rights award for promoting human rights education and leaning for social and economic transformation.